Morgan Drexen Integrated Systems (http://www.morgandrexen.com) is amplifying an urgent message from the American Heart Association: more women in the United States die of heart disease than all forms of cancer combined. This critical fact was the focal point of the 9th annual “Go Red For Women Luncheon,” held March 22 at the Island Hotel in Newport Beach, CA. Four female executives from Morgan Drexen attended the event. Rita Augusta, Chief Operations Officer; Susan Muzila, Director of Strategic Planning; Cathea Walters, Director of Client Development; and Karen Carlson, Vice President of Media and Public Relations, all arrived together as a sign of solidarity. Augusta has personally dealt with cardiovascular issues, and is grateful to the AHA. 1 in 3 American women die of heart disease every year. In comparison, 1 in 31 American women die from breast cancer every year. 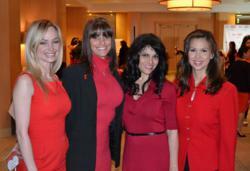 The “Go Red For Women Luncheon” brought together over 500 community and business leaders from throughout Orange County. Morgan Drexen donated $2,500 for a table sponsorship. The event featured a silent auction, a health expo, educational sessions, a hearth-healthy luncheon, and an impressive list of speakers. Heart disease survivor and “Passion Speaker” Christine Wanamaker shared her inspirational story. Some of the entertainment for the event was provided by a group of young classical musicians from nearby Christian Montessori School in Costa Mesa. Rita Augusta, Morgan Drexen’s Chief Operating Officer, was especially pleased with their performance – her 8-year-old son Dante played violin for the group! Augusta made a personal donation to sponsor a table on behalf of the young musicians. Morgan Drexen has held multiple fundraisers for the American Heart Association, with more being planned for the near future. The company most recently participated in National Wear Red Day on February 1, 2013. The event raised money and awareness for the Go Red for Women movement and its crucial mission to save lives and inform women of the dangers of cardiovascular disease. For more information, or to donate to the American Heart Association, visit http://www.americanheart.org. Based out of Costa Mesa, CA, Morgan Drexen (http://www.morgandrexen.com) creates efficient and innovative business systems for professionals and service organizations across the United States. The company’s proprietary software programs are designed to improve productivity and reduce costs.